build relationships among each other to help us address our local challenges. Over the last decade, we’ve visited Lawrence (KS), Ann Arbor (MI), Madison (WI), Asheville (NC), Greenville (SC), Athens (GA), and Boulder (CO). Scroll down to learn more about these previous experiences and outcomes. In September 2018, an impressive delegation of 79 local leaders, including elected officials, business owners, nonprofit directors, and university officials, traveled to Lawrence, Kansas - the cradle of basketball and home of the KU Jayhawks - for the 2018 Inter-City Visit & Leadership Conference. This three-day learning experience featured 15 sessions and deep dive discussions with more than 100 Lawrence leaders, including the Chancellor of the University of Kansas, the President of Haskell Indian Nations University, the Mayor and Manager of the City of Lawrence, and the President & CEO of the Chamber of Lawrence. Anchor experiences: deep dive tours and in-depth discussions on Lawrence hallmarks (the Bioscience & Technology Business Center, Peaslee Tech & the Lawrence College and Career Center, and Sports Pavilion Lawrence & Rock Chalk Park). Spotlight sessions: community conversations in a variety of formats - including PechaKuchas - on key focus areas, including: branding a community, creating a thriving downtown, building community resiliency, rethinking the future of education and entrepreneurship, and partnering in a university town. Choose Your Own Adventures: smorgasbord of timely topics, including conversations on community history and equity as well as hands-on experiences: Walk the Wetlands, Bike the Loop, Tour the KU Campus, Savor the Arts, Learn Lawrence History, and Dive into Downtown. View pictures and read the full press release. In September 2016, the Chamber’s Partnership for a Sustainable Community hosted nearly 80 travelers as they explored Boulder and Denver, Colorado. Chapel Hill Mayor Pam Hemminger, Hillsborough Mayor Tom Stevens, and Commissioner Earl McKee, former chair of the Orange County Board of Commissioners, served as honorary co-chairs of the 2016 Inter-City Visit. How can we support private sector job creation including talent recruitment, startup retention, and business attraction? How can we build the infrastructure we need to accommodate projected growth and ensure transit options to move people around the community and region? How can we continue to ensure that our downtowns are attractive, accessible, and achieving our economic goals? How can we continue to innovate in town and gown collaborations? How do we build a more diverse stock of housing choices? How do we find common ground and build coalitions in a divided political climate? How can we improve placemaking and storytelling about our communities? 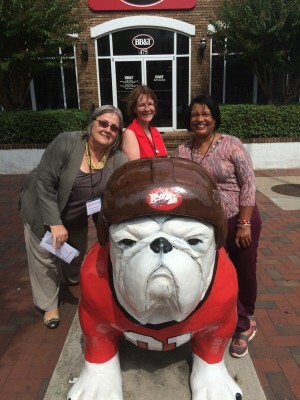 In September 2014, the Chamber and its Partnership went on a three day trek to Athens, GA, with 100 business and non-profit leaders, university representatives, and elected officials for the 2014 Inter-City Visit. On their way there they also had the opportunity to pass through Greenville, SC. Much like Chapel Hill, Athens is a progressive university town committed to community development, innovation, and entrepreneurship. Through the Partnership, our community leaders were able to explore downtown Athens taking in the cuisine, nightlife, and culture; as well as speak with Athens-Clark County community leaders. A powerful community convener, the Part­nership brought together 70 diverse com­munity leaders – local business owners and managers, elected officials, university faculty and staff, non-profit executives and volun­teers, municipal and county staff, and media – for the 2012 Inter-City Visit and Leadership Conference in Bloomington, IN. In Bloomington, the Partnership helped our community leaders learn from the expe­rience of another progressive university community, better understand our assets, and build relationships that help us address successfully our local challenges and oppor­tunities.